It is that time of the year and you have invited your friends and neighbors over for a Back Yard BBQ. As you get ready for your annual event you discover that the dingy grime from winter is still clinging to your exterior. Have no fear - rent a power washer to get the job done in record time. A pressure washer will clean mold and mildew off the deck or even the home siding. You might even find that you didn't need to paint you just needed a good cleaning of your homes exterior. If you are painting this is the best way to clean a surface like a pro prior to painting. With the snow storms, freezing rain, cold temperature and also the mess left out by winter grime, you will find there are plenty of uses for a power washer. Hard surfaces like pathways, patio and exterior of the home should be on your short list for blasting away dirt and grime. Other uses are patio furniture, decks - both wood and composite, and concrete patios. There is no doubt you will find renting a power washer is both efficient and fun. A pressure washer or power washer is a great tool to make any clean up job economical and unbelievably easy. How does a Pressure Washer or Power Washer work. 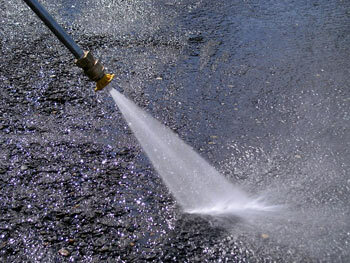 Quite simply it forces out water high pressures and blasts away dirt, grime, mold and mildew without using much water. This makes renting a power washer the green way to go as well. A power washer includes a gasoline powered engine that drives a higher pressure water pump. A garden hose supplies clean, fresh water in the water source towards the pump about the inlet side. A specifically designed hose, handle and trigger set provides you with the charge of our prime pressure water and cleaning energy. All safety precautions must be followed. Putting your hand in front of the high pressure nozzle can result in soft tissue injury and cuts. The water that's being released from the nozzle can be ruthless, it may harm softer materials. Test the water out or move back and have less pressure striking the object. Using a Power / Pressure washer, is as simple as 1, 2, and 3. Connect a garden hose to some water supply such as an outside hose bib. Make sure there will be plenty of water flow from the hose and that it is not kinked or restrict water flow. Connect your primary pressure hose set up and wand when using the nozzle and then turn the water on. Squeeze the trigger about the handle and permit the water to operate to find the air from the hoses and pump. Then start the engine washer and begin your cleaning project. Connect your hoses and start the engine, be mindful and be sure the water hose is clean inside before connecting and turning the water on. Any grime within the hoses will clog the pump and nozzle. If you cleaning your concrete clear out as much as you can from the garage. Work the nozzle from the back of the garage to the front blowing out the dirty water. Close the garage door. Carefully wash the inside and outside of the garage door. Move down the driveway to the curb. Move in the direction of water flow, we hope that is from the house to the curb. If not then you have other problems as well. For persistent spots, try holding the nozzle nearer to the problem area, degreasers can be useful when cleaning oil spots but won't remove stains. Rent a gas power washer and have some fun, be clean and safe all of your outside hard surface areas while conserving water along the way. Follow the same principles as the front yard, except you can wash off the BBQ, patio furniture deck and many other hard surfaces. Rember if you pressure wash your BBQ the gas jets will need to be fully dry. before operation. You will be saving time and helping the environment at the same time. If you have ever used a brush and bucket of water to wash all of the black goo off your deck you know all too well how long the process and how much of a pain in the back and neck that can be.